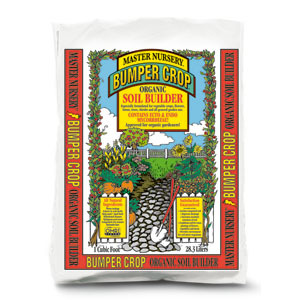 Bumper Crop Organic Grower’s Mix is an incredibly, biologically diverse growing medium designed to increase budding and yield in all your container plants! It is carefully formulated using natural ingredients and proper composting methods that result in a consistent growing medium. Our exclusive recipe provides an ideal balance between water retention, soil texture, drainage and aeration. Available in 1.5 cf bags at selected retailers. Our new super soil promotes leafing, budding, flowering and fruiting. Premium ingredients include mycorrhizae, kelp, lobster & crab shells and seabird guano. Specially designed for professional and amateur container growers. 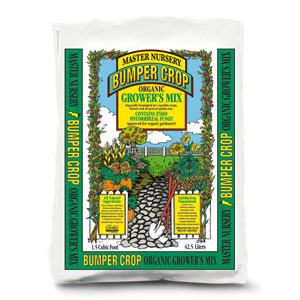 Bumper Crop® Grower’s Mix also contains several other key ingredients that add to or help support healthy soil. Worm Castings teem with beneficial soil biology. Lobster and Crab Shells are naturally rich in amino acids, calcium and chitin. Kelp Meal helps to stimulate soil bacteria and boost soil fertility. Dehydrated Poultry Manure and Peruvian Seabird Guano are great for growing green and vigorous plants. Sphagnum Peat Moss provides a stable environment for root growth, helps hold water and maintain pore space surrounding the root zone. Composted Cow Manure also contributes to active biology and is rich in the organic matter plant roots need. Aged Bark provides additional organic matter in the form of spongy pieces of decayed wood and bark adding structure and holding moisture. Dolomitic Lime helps adjust pH and Perlite has a porous surface that provides room alternatively for both air and water in the blend. Finally, Coir or coconut fiber is a great natural wetting agent. This pith portion of the coconut acts as a natural wet- ting agent by absorbing water yet leaving the soil surface dry. In a nutshell, healthy soil is the key to growing healthy plants! Select a container with drainage holes. Put a layer of gravel or bark on the bottom the container to prevent the mix from escaping and to keep the roots from becoming waterlogged. 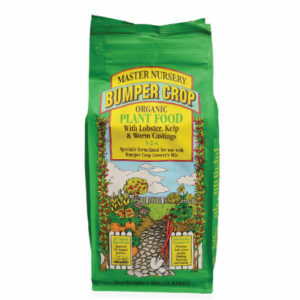 Place enough Bumper Crop® Grower’s Mix in the container so that the plant will sit at the proper height near the top (within 1 or 2 inches) of the container. Water the soil to compress it, then center the plant in the container. Add more mix until it is slightly above the root ball, then water again until it drains from the bottom. The top of the root ball should be even with the top of the mix. 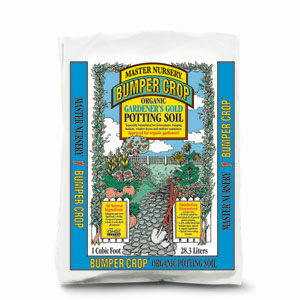 Be sure to use Master Start® Fertilizer to get your plant off to a great start and follow up with the appropriate MASTER NURSERY plant food to keep your container garden thriving. A premium soil builder made from only the finest all-natural organic, composted ingredients. A versatile blend excellent for a wide variety of garden applications. A best seller! An organic all-purpose soil designed for potting indoor and outdoor container plants. It is compost-based and nutrient-rich and will offer excellent plant performance. This product meets the organic production standards of the Maine Organic Farmers and Gardener’s Association (MOFGA) and is MOFGA listed for organic production. Produced by Coast of Maine Organic Products, Inc., 145 Newbury Street, Portland, Maine, 04101 For Master Nursery Garden Centers, Inc.